Satellite communications systems encompass a wide range of solutions providing communication services via satellite(s) as illustrated in the scheme below. Space component of communication systems are located in the outer space following different types of orbit among which, Geostationary (GEO), Medium Earth Orbiting (MEO), High Elliptical Orbit (HEO) or Low Earth Orbiting (LEO). SatComs operates in Frequency bands allocated to Broadcasting, Fixed or Mobile Satellite services in low frequency bands (below 3 GHz, such as VHF, UHF, L and S band) or in higher frequency bands (above 3 GHz, such as C, X, Ku, Ka, Q and V bands). SatCom systems can address a wide range of services broadcast, broadband and narrowband services to fixed, portable and mobile terminals over global or regional coverage. Some SatCom systems provide service coverage all over the earth including the north and south poles. They are well recognised to provide a resilient and ubiquitous service and to be particularly cost effective for “one to many” (broadcast) and “many to one” (data collection) services which is ideal to complement other telecommunication technologies to meet the “everything, everywhere, all the time” Internet paradigm. Hover over the light-green boxes to get more information! 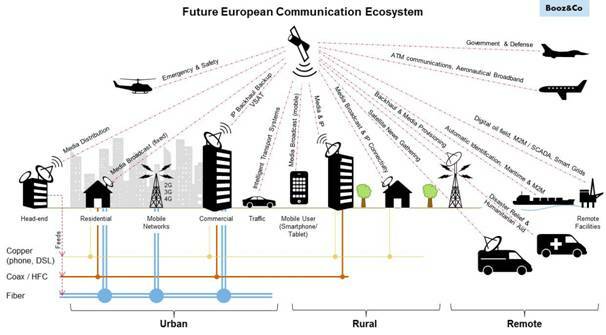 Communicate the SatCom WG proposed inputs to H2020 research plan to European and national bodies such as DG Connect, DG Enterprise, ESA and national space agencies, Eurospace and ESOA (objective is communication, endorsement by public bodies and duplication avoidance). Promote the need for financial support for European SatCom industry’s research and innovation activities towards the European institutions. Analyze the EC policies/communication related to SatCom R&D, develop and convey the sector position towards the EU stakeholders.